The trail system on the USA Campus is well-marked to say the least. Just past the parking area is a nice kiosk with a large map of the trail sysem. One of the top mountain biking trail systems on the Alabama Gulf coast, the trails at the University of South Alabama (USA) offer a wide variety of challenges including a few hills, narrow bridge crossings over gullies and swales, and a chance to get up some speed over the otherwise flat terrain. Some good hills, tight turns, bridge and ramp crossings over wetlands. A little gem tucked away behind the campus of the University of South Alabama, the trail system called the USA Trails is described as one of the best mountain biking systems in south Alabama. Three singletrack trails, one for each level of rider, wind their way through the forest over generally flat terrain but then you hit some nice steep hillsides and wet and muddy patches and swales that you cross over wooden ramps and narrow bridges, some only 6 inches wide. 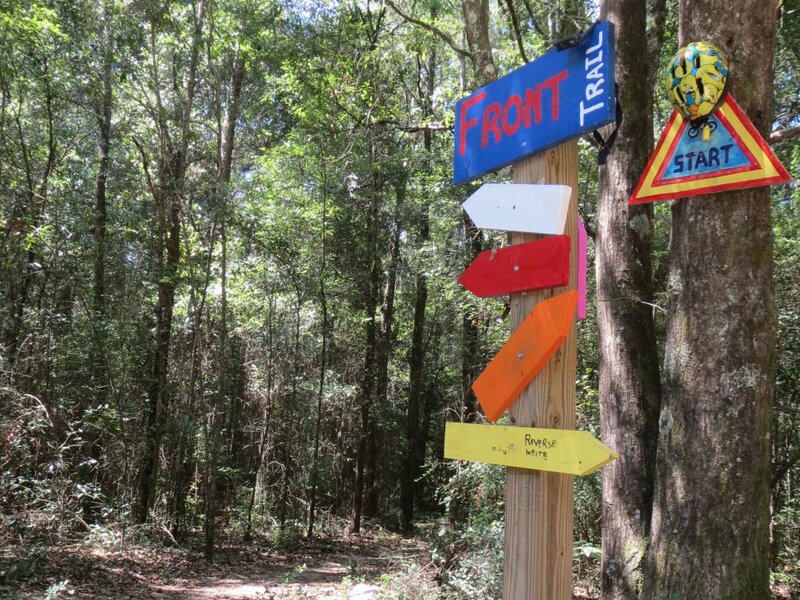 Tucked away on the back side of University of South Alabama (USA) campus in Mobile, Alabama, there is a series of mountain bike trails that are recognized as being some of the best in the area. They are called the USA Trails. 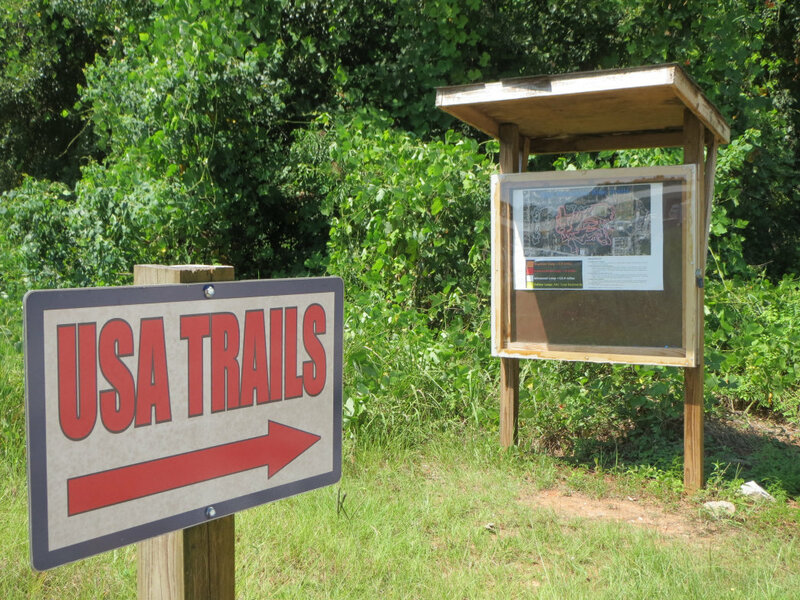 The trail system was built and maintained by SAMBA, the South Alabama Mountain Biking Association. This is a group of dedicated volunteers who not only opened these trails and made them available to the public but also build and maintain many other trails on the Alabama Gulf coast. There are three trails: the Beginner, Intermediate, and Advanced. The trails are well marked with painted wooden “arrow” signs showing you the direction of travel: Beginner is orange, Intermediate is red, Advanced is white. A fourth yellow blazed trail is actually the Advanced trail that you ride backwards in the reverse direction. The relatively flat trails allow you to get up some good speed. There are a few decent size hills where you can hone your skills on tight turns and wooden bridges, some only a few inches wide, over wetlands and swales. The trails are located behind a student residential area and sports field and because of this the main road in, Cleverdon Parkway, is closed between 7 p.m. and 5 a.m. There is a trail for everyone on the USA trail system. For beginners there is the orange 3.5-mile Beginners Loop; for intermediate riders the red Intermediate Loop (8-miles); and for the more experienced cyclists the 12.4-mile white marked Advanced Loop which can be ridden in the opposite direction making it 24.8-miles (this route is marked in yellow). While relatively flat there is plenty to challenge beginners while more advanced cyclists can hone their skills on the narrow winding trails with wooden bridges, some only a few inches wide, over wetlands and being flat with only some small hills you can really get up some speed. In Mobile, Alabama, at the intersection of Hillcrest Rd. and Airport Blvd. take Hillcrest Rd. north 3.5-miles. Cross over Old Shell Road (Hillcrest now becomes Cleverdon Parkway). Travel 0.4-miles and turn left onto John Counts Dr. Parking is straight ahead in about 300 feet on the right. After parking ride up the gravel road. A kiosk with a trail map will be on the left next to a small pond. The trails are located just outside of a student residential area and sports field on the campus and as such the road in, Cleverdon Parkway, is closed between 7 p.m. and 5 a.m.
As always, helmets are required. Hikers and joggers also use these trails and they have the right of way. And if you see trail that needs maintenance, don't do it yourself. Report it to SAMBA (see "Land Website").